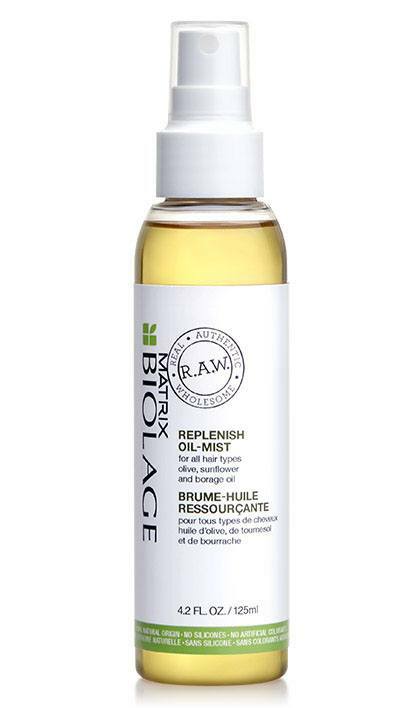 Share https://www.matrix.com/biolage/raw/raw-products/replenish/raw-replenish-oil-mist R.A.W. Replenish Oil Mist for All Hair Typeshttps://www.matrix.com/~/media/images/haircare/biolage/raw/2018/biolage_raw_replenish_oil_pdp.jpg A custom oil blend that creates smoother, softer, shinier hair. Suitable for all hair types. Biolage R.A.W. Replenish Oil Mist is a custom oil blend for all hair types and textures to achieve softer, smoother, shinier hair. A little hair oil goes a long way..
*An ingredient is considered natural-origin if it is unchanged from its natural state or has undergone processing yet still retains greater than 50% of its molecular structure from it's original plant or mineral source. Caprylic/Capric Triglyceride, Coco-Caprylate/Caprate, Olea Europaea Fruit Oil/Olive Fruit Oil, Undecane, Tridecane, Borago Officinalis Seed Oil, Parfum/Fragrance, Tocopherol, Helianthus Annuus Seed Oil/Sunflower Seed Oil, Linalool, Citronellol, Rosmarinus Officinalis Leaf Extract/Rosemary Leaf Extract, Benzyl Alcohol, Geraniol, Foeniculum Vulgare Oil/Fennel Oil, Cistus Ladaniferus Oil, Limonene, Eugenol, Benzyl Benzoate, Farnesol, Citric Acid. Fine Hair - apply to dry hair before shampooing / add to conditioner. Other hair types - apply to dry hair overnight/ apply to wet or dry ends / apply before shampooing / add to conditioner. Suitable for use on body, too!